I am always pleased to teach what I’ve learned from the old men and old women who have helped make me who I am today (an old man!). Skype and private banjo lessons, as well as workshops are on offer. I’ll tell you, teaching Clawhammer banjo is trickier than it might seem. 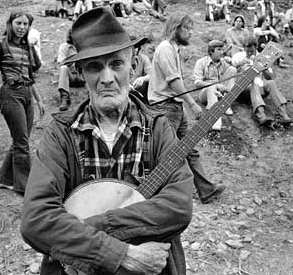 One a Monday, at the beginning of a week at the Swannanoa Gathering, I encountered very committed and fine people in my Old Time Banjo class who’d taken several summers’ worth of banjo classes at various traditional music camps and, sadly, couldn’t play a lick correctly. I realized I was in a lot of trouble. Clawhammer’s all about getting the picking hand right, and that’s mostly about getting the attack and the thumb right. You can learn a thousand tunes with your fretting hand and it won’t mean a thing until you get the picking hand to behave itself. So, I shelved my plans to teach lots of tunes and tunings, and turned to basics. Within the first hour on Tuesday morning, I had their thumbs playing correctly and we gradually widened our focus from there, returning at the beginning and end of each class to the basics. By week’s end, I had some banjo players on their way. I must tell you, I don’t know what the other banjo teachers were doing with them, but they couldn’t play on Monday. Not a lick. I first encountered Clawhammer banjo when I arrived at Washington & Lee University in Lexington VA in the fall of 1970. I was 17 and had been playing guitar for two years. My Geology professor, paleontologist Dr. Odell S. McGuire, had cultivated a burning desire to play the banjo and was busy driving up and down the countryside on weekends to find senior old-time musicians and learn as much as he could from them. Knowing the value of this, I became Odell’s companion and co-conspirator. Entering deeply into his musical life, spending many weekends and days at his home or on the road camping with his kids and his wife, Mata, I became sort of like a member of his family. In the fall of 1971, we began to venture up into Pocahantas County in the high country of West Virginia to visit the Hammonses. A family of musicians that for generations had been cited as sporting West Virginia’s finest singers, fiddlers, banjo players, these people were like striking gold to us. Maggie Hammons Parker, Burl Hammons, and Sherman Hammons were all siblings, born in the late 19th Century. Maggie spoke often about flagging down the train to get a ride through the mountains into town. And about singing for the loggers when she was out picking berries as a young girl (“They used to give me five dollars for a song! Yes, sir! One song!! ). I learned a great deal about life and music from these people. But when it comes to the banjo, it was Mr. Lee Hammons who left the deepest mark on me. Lee was a generation older – born in 1888 – and had some indirect connection to the rest of the Hammonses, possibly through Hammonses out in Kentucky. In 1928, Lee gave up playing clawhammer banjo, when by his account, he fired the fellow who owned the banjo from the lumber camp Lee was managing. When the fellow left, the banjo went with him. Lee didn’t take up his music again until 1969, after some persistent badgering and canny cajoling by Dwight Diller. Lee gave up the banjo just as commercially recorded music started to become available. The Carter Family, early country stars, bluegrass…he heard it all, of course, but none of it touched his playing or his memory of the music. So, when he picked up the banjo again, it sounded like you were sitting in the mountains: kerosene and candles, quiet as a grave, the silent hills being sculpted by the sounds of music made by hand. His playing had an archaic feel to it. He drew out of the banjo a sustain and sounds that were singular in their clarity, playfulness, and tangibility. You could almost reach out and touch the sound in the air when Lee played. From 1969 on, Lee struggled to unearth tunes and tunings he remembered from more than four decades earlier, pulling old pieces back into living memory. If there is anything special I have to offer as a clawhammer banjo player, it is what I was gifted by Lee Hammons. He used his hands and the instrument in distinctive and non-obvious ways. His playing had real spirit to it. Lee Hammons’ playing shaped how I still hear and use the instrument today. For at least three centuries, we’ve thought that the American banjo was at least a relative of an African instrument. In the earliest extant accounts and illustrations (ca. 1790), we find these instruments in black hands. We have had a lot of circumstantial evidence and it seemed for a long time that we’d have to be content with that. Then Daniel Jatta turned up. Raised by the Jola people, Jatta was studying accounting in Atlanta GA when he was struck by the similarities of bluegrass banjo playing and the akonting – an instrument of his youth, family, and tribe. The structure of the instrument and its style of being plucked is shockingly similar to the American clawhammer banjo. And the similarities cannot be ignored. A good article on Jatta’s research and conclusions is here. Through workshops, individual and small group private lessons at home in Vermont (or when I’m touring in your area), or via Skype lessons, I can help you get right with your right/picking hand technique. Once that’s established, then we’ll follow up with the special tunings and tunes that Lee remembered, as well as standard fiddle tune fare, at your request. Use the form below to contact Scott to arrange a private lesson or the booking form to arrange a workshop in your area when Scott is on tour. Form submissions will go to both Susan at Loyd Artists and Barb at Cattail Music.